The Gerontology Interdisciplinary program at UNC Charlotte stated in 1990 and it includes students and faculty from many disciplines. Currently the program is sponsored jointly by the College of Health and Human Services and the College of Liberal Arts & Sciences. 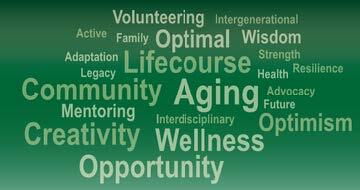 We offer an undergraduate gerontology minor, a graduate Certificate in Gerontology and a Master of Arts in Gerontology. The multidisciplinary nature of the program prepares students and professional interested in specific careers in the field of Gerontology. The Gerontology program office is located in a suite of offices on the fourth floor of the beautiful College of Health and Human Services Building. However, as an inter-disciplinary program, many of our faculty are located in other colleges. Please be sure to check our staff and faculty directories for specific office locations. Charlotte’s unbeatable weather and healthy business climate have made it one of the fastest growing metropolitan areas in the U.S. But you can enjoy the great outdoors with our miles of walking trails and access to boating, biking, parks, lakes and nearby mountains. Charlotte’s got a lot to offer, including cultural activities and museums, professional sports teams, the U.S. National Whitewater Center, Carowinds (“The Thrill Capital of the Southeast”) and Lowe’s Motor Speedway.